Past Remembering: When people meet dinosaurs! There are certain instances where a picture is worth millions of words. Such is the case with dinosaurs and the timeline fabricated by the materialists. 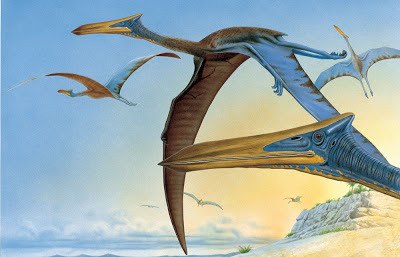 They emphatically state as fact that the creatures we call dinosaurs completely died out millions and bazillions and gadillions of years ago, long before any human beings existed. 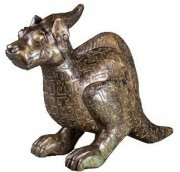 So what's with all the carvings, ceramics, bronzes and cave drawings that were made in earlier times (by men) that seem like they couldn't possibly represent anything else? Bless their hearts, they hadn't received the benefit of an evolutionary education, so they didn't know they weren't supposed to be seeing these creatures. 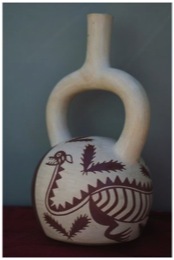 This is a native African wooden carving. 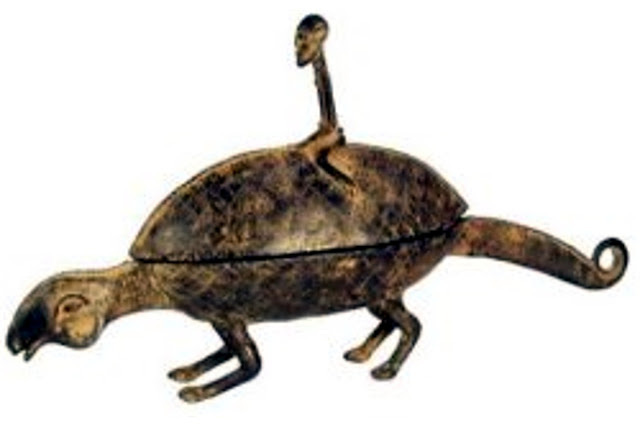 This creature obviously isn't a turtle or an armadillo. 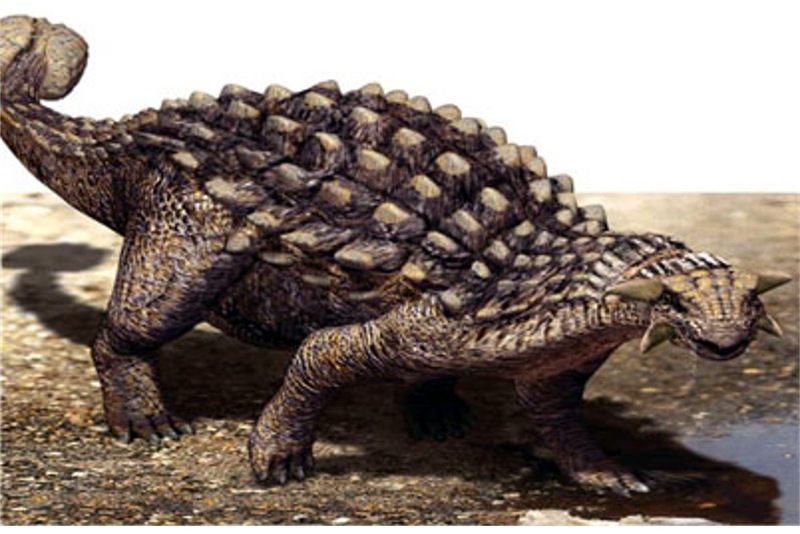 Resembles this nodosaur, though, does it not? 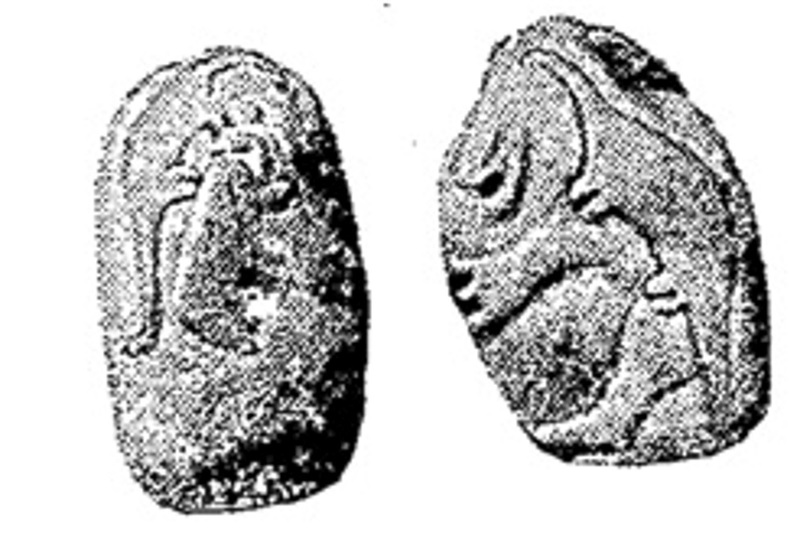 The stone on the left shows a dinosaur with an elephant-like creature. 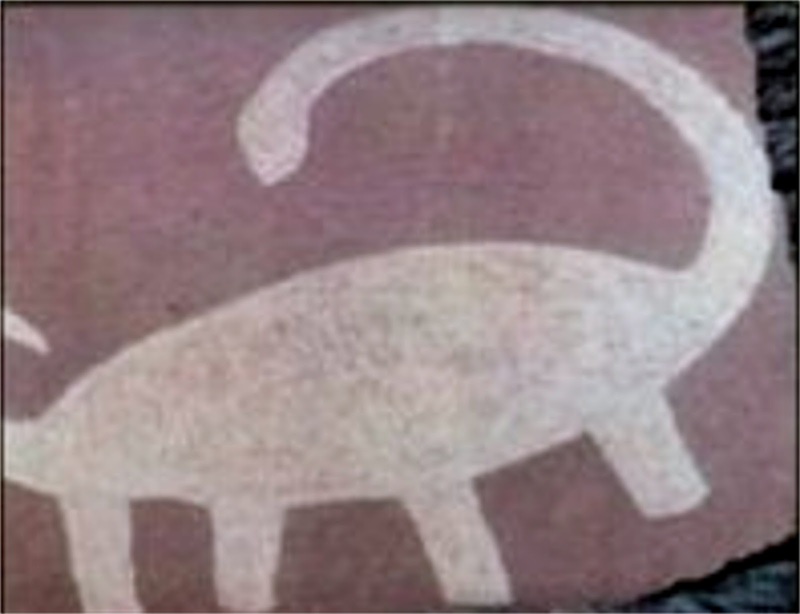 See any similarities to the rock carving? Or to the one below? 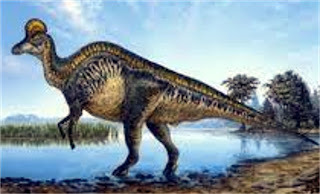 Sauropod (four legs on the ground, long neck, long tail, small head, like what used to be called a brontosaurus) again. 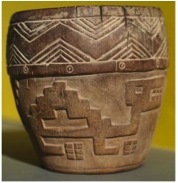 This one is attributed to the vanished Anasazi people of the American Southwest. 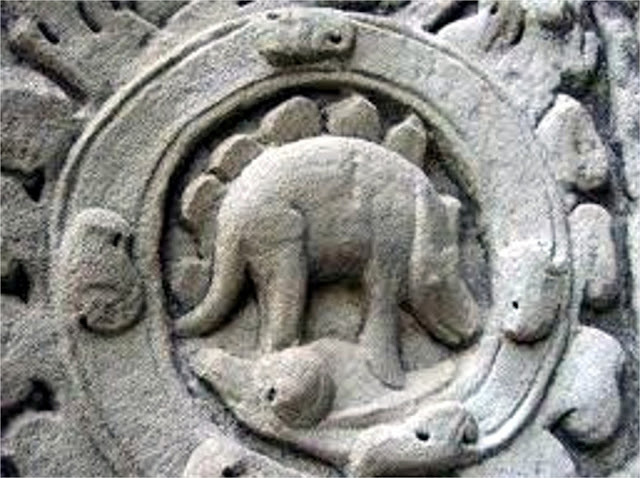 Stegosaurus-like creature carved on one of the pillars at Ankor Wat, an ancient lost city in Thailand. We've discussed the Babylonian sirrush in detail in a previous blog. 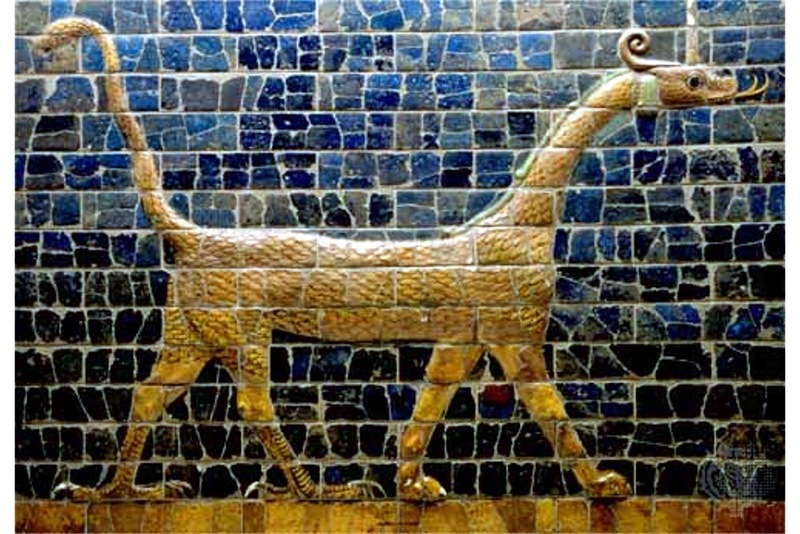 The consistent way that it is portrayed in Babylonian art and the details (it even shows the musculature and joint bones in the legs) argues for a real life model that existed at the time this artist did his work. This is an aboriginal rock drawing from Australia. 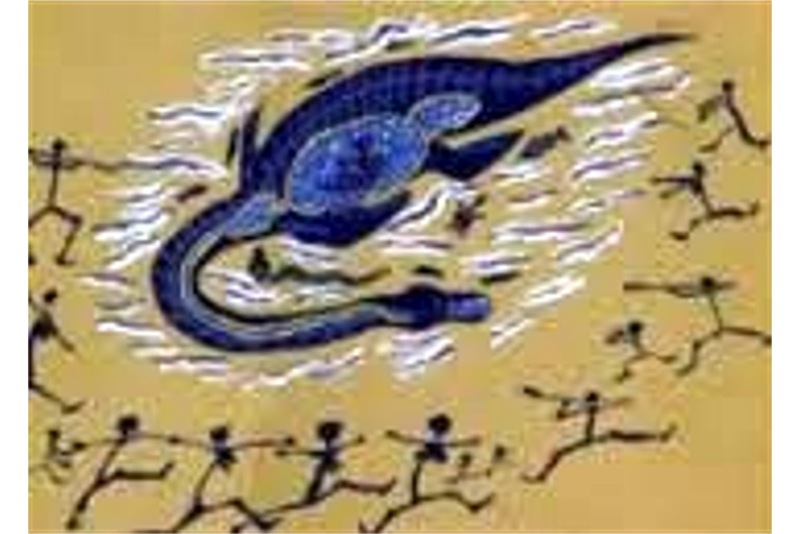 The aborigines would draw the internal organs of a creature to let you understand that they had killed and dissected this animal. Plesiosaur for dinner, anyone? 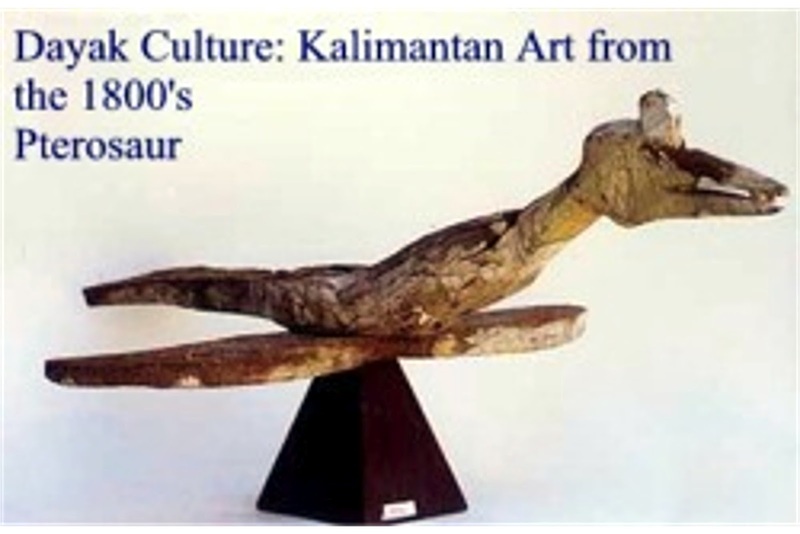 This carving is from Sumatra. The two legged creatures are either gigantic roosters or perhaps a creature called a Corythosaur., depicted below. Similarities to this representation of a Quezalcoatlus? The Chinese have a long tradition of including various reptilian creatures in their artwork. 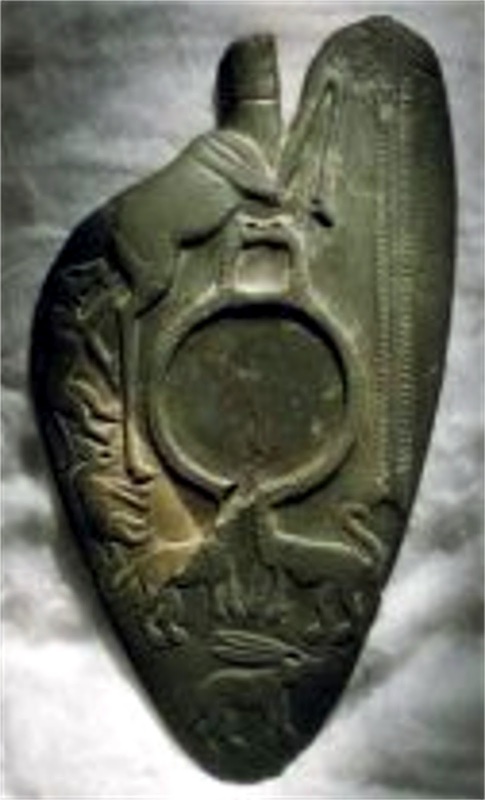 It is interesting, however, that this Shang dynasty jade carving is remarkably similar in many ways to the Tsintaosaurus (seen below), which was known to exist in the area of China. Drawing on a cave wall of a dinosaur and elephant head butting? 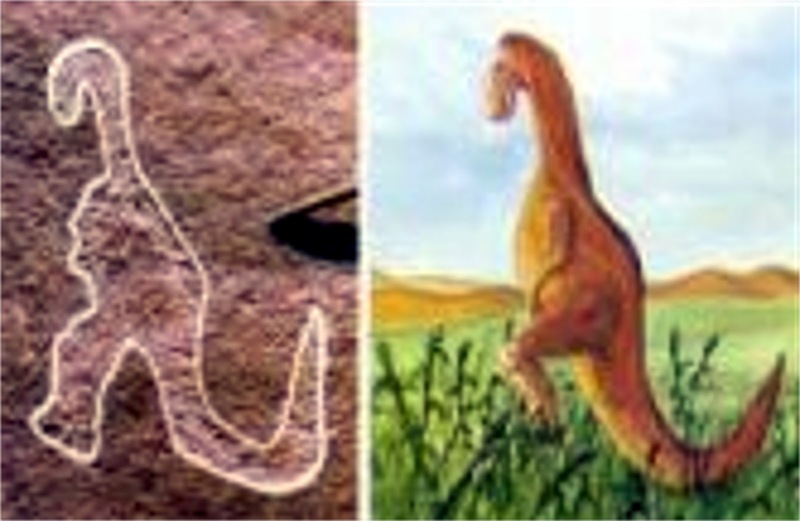 A cave drawing from the American Southwest compared to a drawing of a very common dinosaur called a hadrosaur. Even more cave drawings. What is he spitting out of his mouth? Is it sneezing? Did dinosaurs chew tobacco or is he breathing fire? 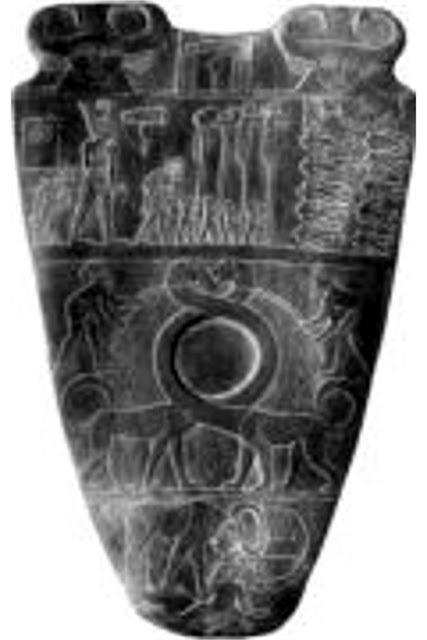 When dynastic Egypt of the Pharaohs was founded, about 3,100 B.C., the Egyptians made many make-up palettes on which they would carve various designs. 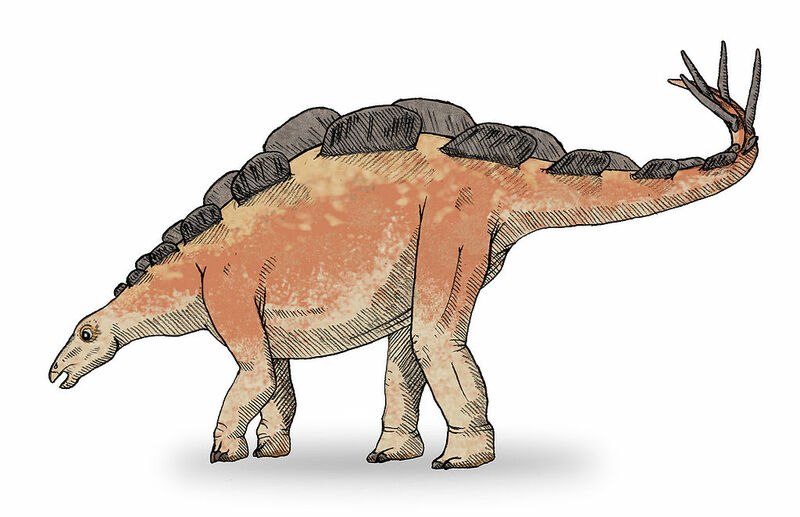 Several of these show creatures that could only be dinosaurs, with short bodies and legs, and long necks and tails. Poor, stupid, uneducated Egyptians! They hadn't been told yet that the creatures they were seeing hadn't existed for gazillions of years. 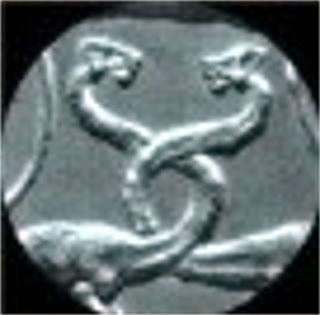 This is an enlargement of the carving in the photo above. 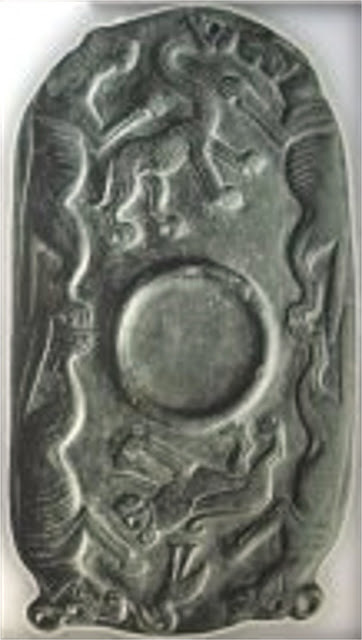 Another make-up palette of a similar period. 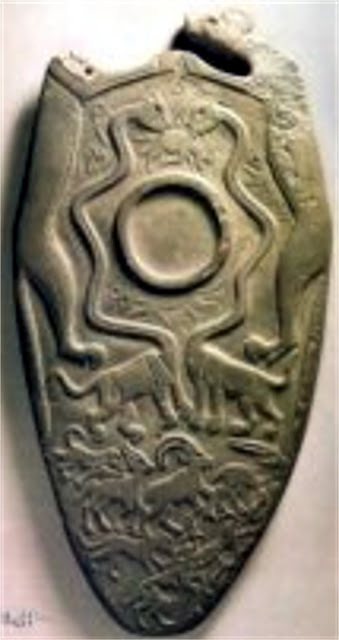 Yet another, with a detail of the creature carved on the top of the palette is seen below. 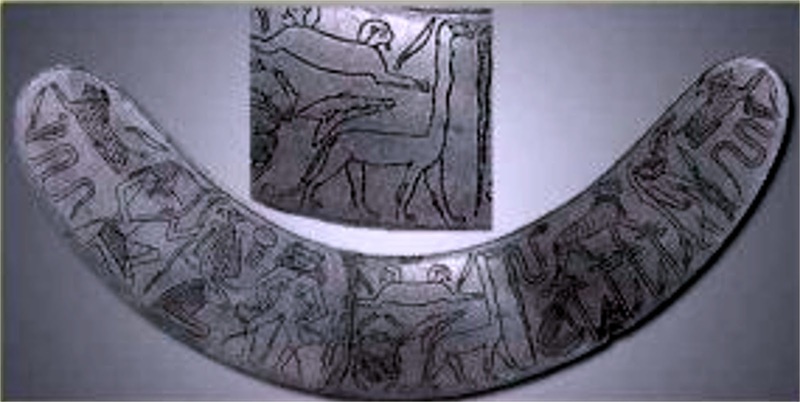 While it looks like a boomerang, the long curved object is a wand that various magic rituals would be performed with. 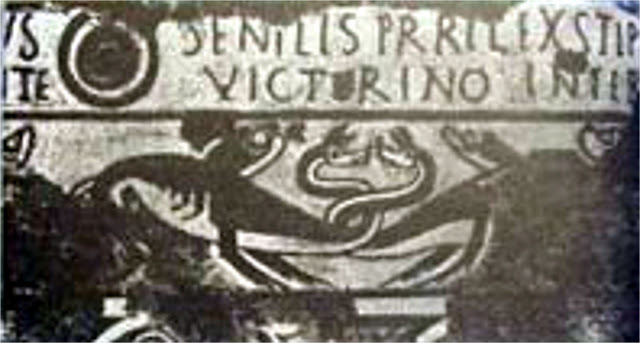 Note the enlarged detail above it and the long-necked creature therein. Another example. 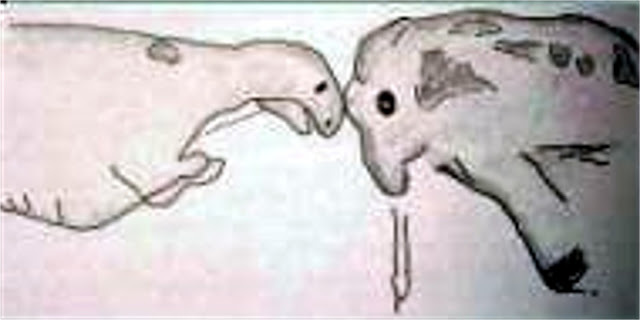 Note that all the other creatures represented are creatures that we know currently exist, like antelope and aardvarks. 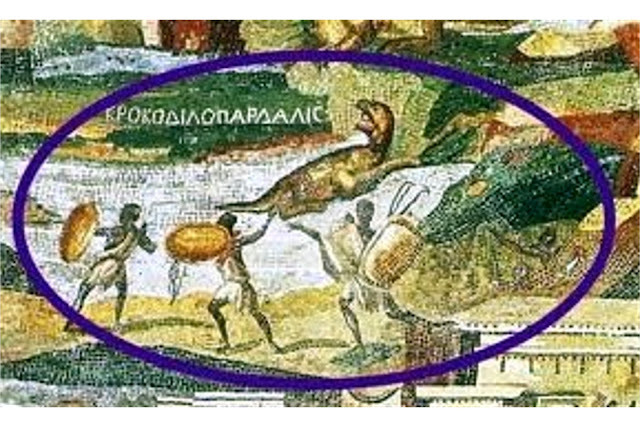 The Greek inscription next to the strange creature depicted on this ancient mural, illustrating life on the Nile is "Krokodilonardalis." The word translates as "Crocodile leopard." Another mural from the classical (ancient Greek and Roman) period. 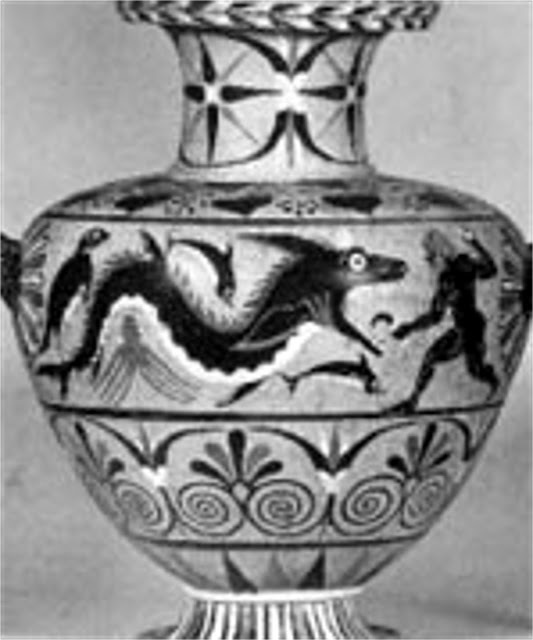 This is an ancient Greek vase. Notice the large creature in the center, surrounded by other known sea creatures that currently exist? 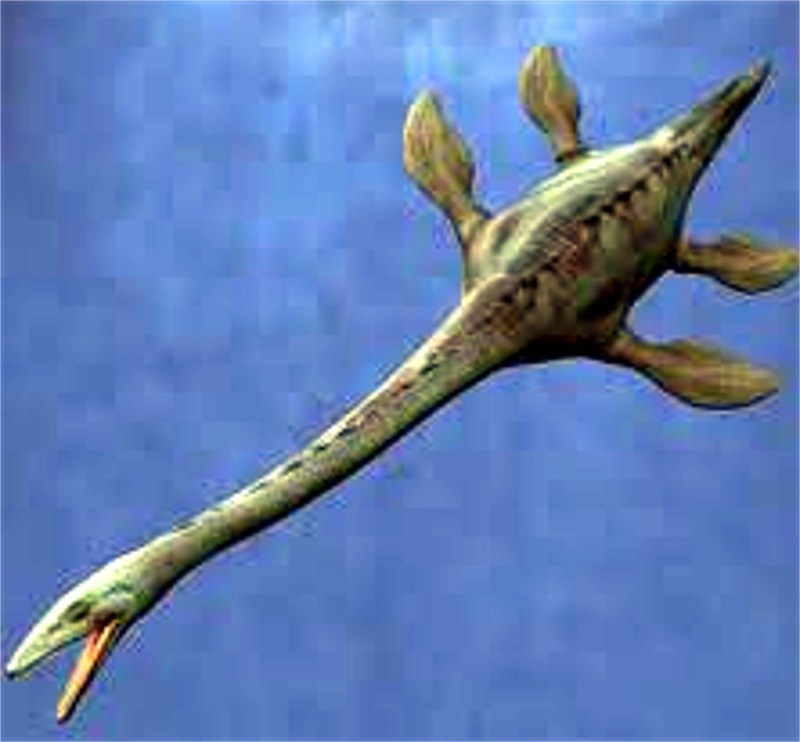 Is the large creature not similar to the mosasaur depicted below? 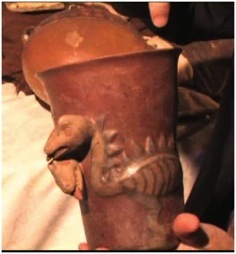 The following 9 images show artifacts worked in ceramic and textile that have been found in various places and from various cultures based in the Andean mountains of Peru, South America. I defy anyone to show how they could be remotely similar to anything except dinosaurs. 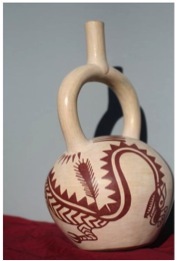 The above two models and ceramic were found among the ruins of the mysterious Carian culture located in modern Turkey. 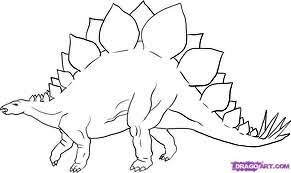 Very similar to the stegosaurus, drawn above. 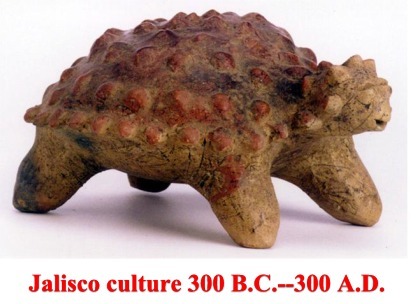 Notice any similarities to the ankylosaur depicted here? 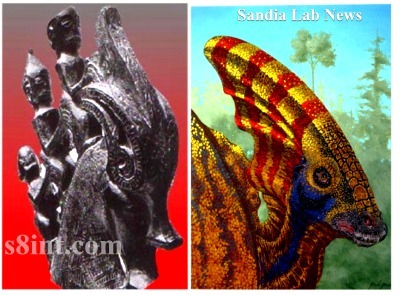 This carving from Indonesia bears a striking resemblance to the head of a dinosaur called parasaurolophus. Now where could that have come from? This is a Native American prayer stick, currently located in a museum. Note anything similar in the drawing below? Of course, let's not forget the marks that dinosaurs have made on people! This sandstone track is part of a large trackway that still exists and is still visible in Glen Rose, Texas. The trackway contains the trail of footprints of this dinosaur and another trail of prints that are obviously human. 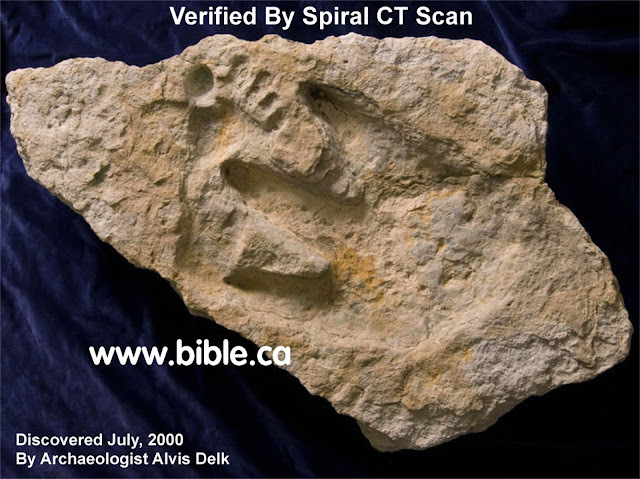 It is clear from the photo that the dinosaur track OVERLAPS the human footprint. 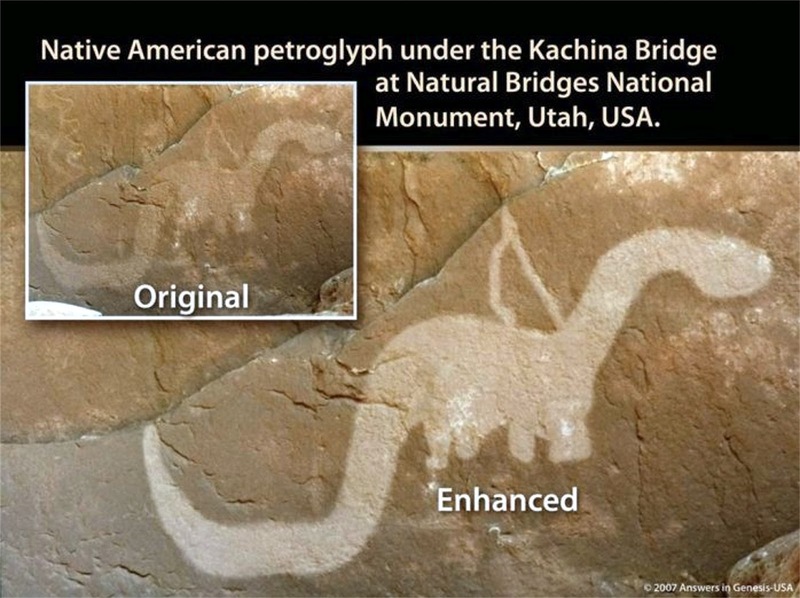 People never saw dinosaurs, say the politically correct scientists. Yeah, right! I hope that this person saw THIS dinosaur coming or he surely was run over! 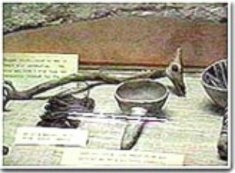 While we're talking about dinosaurs, here's an interesting couple of tidbits of information that I just recently came across. You remember this big guy, right? 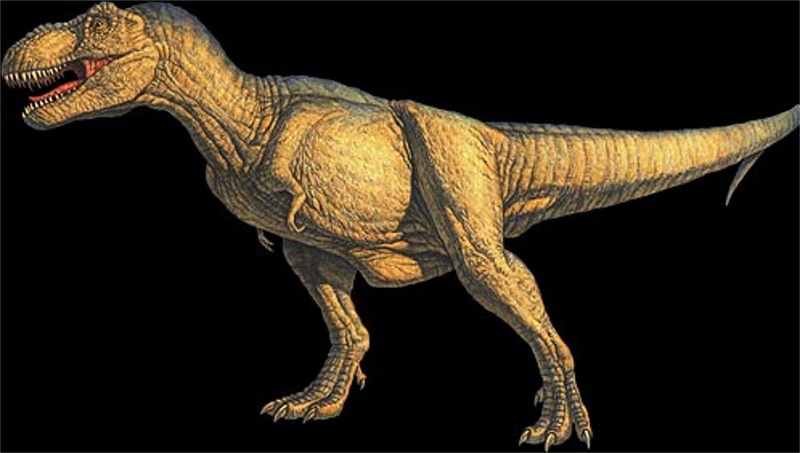 This is a drawing of Tyrannosaurus Rex, one of the most well-known and iconic of all the dinosaurs. Forty feet in length, seven tons in weight (the weight of seven mid-sized passenger cars), head four feet long and a mouthful of fangs, each the size of bananas. It is the equivalent of a Great White shark on two legs. It is terrifying and awesome, even in death. To watch the movies and documentaries, you'd swear that these things were as numerous as flies at a picnic, when they were alive. In point of fact, there are only about twenty skeletons of T. Rex that are close to complete (by complete, I mean 40% or more of it has been recovered). That doesn't include all the bits and pieces of skeletons that have been found. When you see these skeletons mounted in museums, you aren't actually seeing the real bones, but carefully reproduced casts, models made of the real bones. Rightly so, as the real bones are too rare and valuable to be exposed to the possibility of theft or breakage. However, because of that substitution, you may not know that all of the T. Rex bones in museums have been coated with a special paint, that is lead based. The reason for that is that the bones are dangerously radioactive - all of them! (Thoughts toward a coherent view of our ancient past, our present and our future! 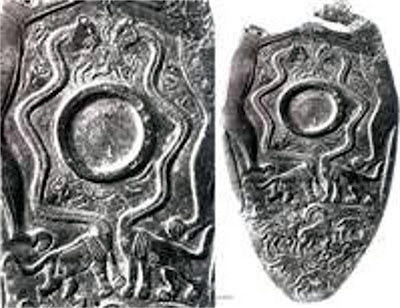 ), know that there is strong physical evidence for the concept that nuclear bombs have been deployed in the ancient past. 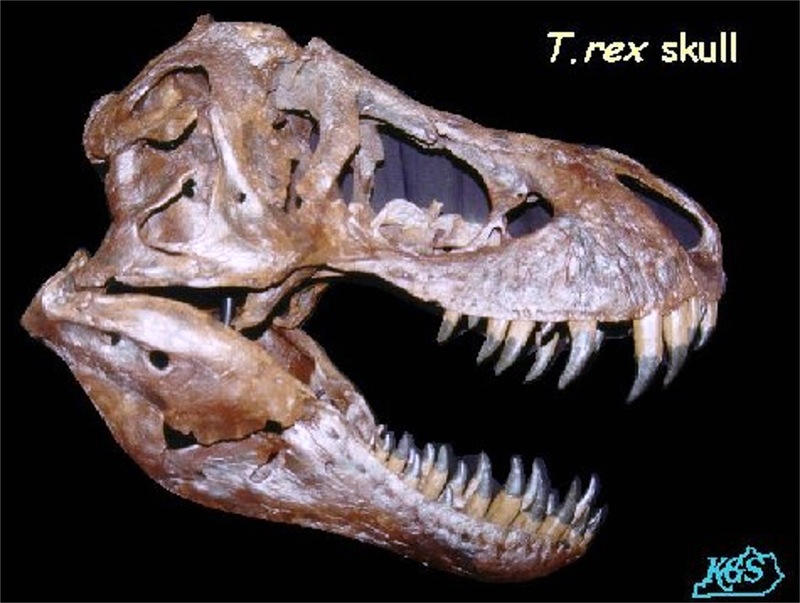 A paleontologist recently sawed one of the T. Rex bones open and found intact cells within it. The cells are so complete that the scientists are talking about cloning their own T. Rex from it! Just to be really clear, there is no way that soft tissues, like cells, could have possibly remained intact for anything like 65 million years, which is how old these scientists say T. Rex's remains must be. Perhaps the radiation in the bones helped to preserve the cells somewhat, but not completely intact and identifiable cells! 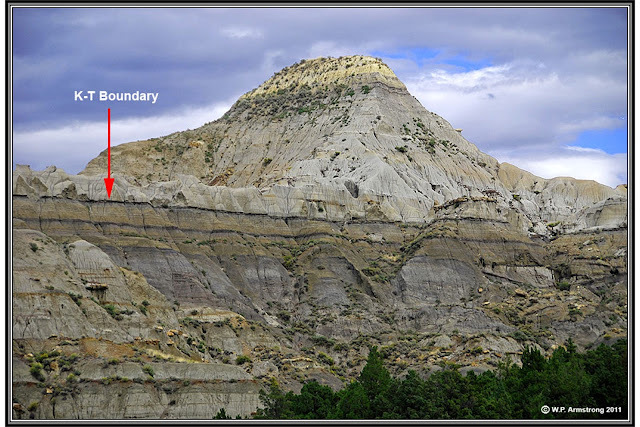 Back in the 70's, there was a great stir because scientists noticed that, in many locations, there was a very thin, dark or black colored layer above which they could find no dinosaur fossils. 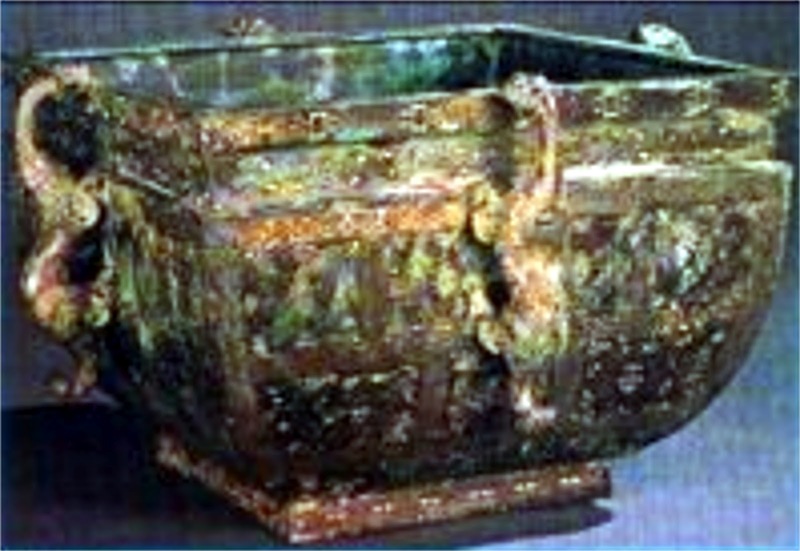 The layer was always rich in iridium, which is a very, very rare material. 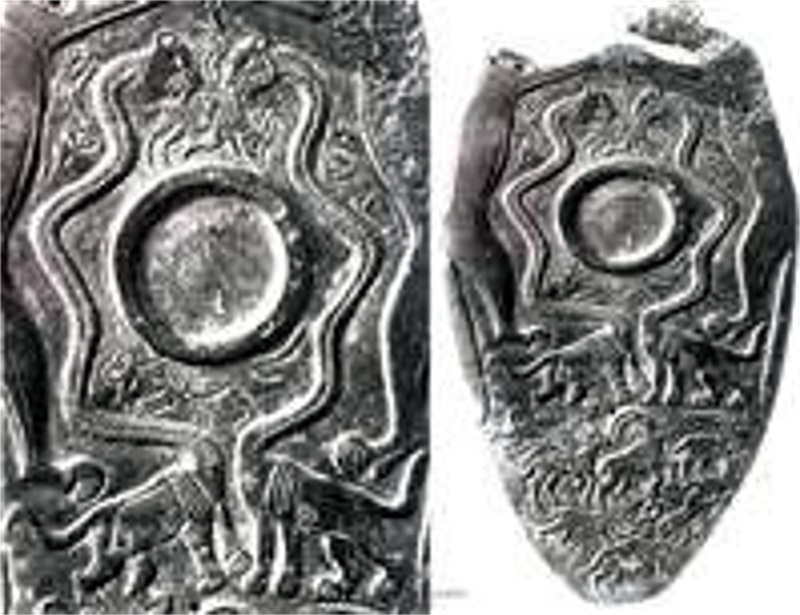 Since it is mostly present in meteorites, and the layer was so extensive, the materialistic uniformitarian scientists could come to only one conclusion - that a massive meteor strike had covered the earth in iridium and caused the extinction of the dinosaurs. This is a perfect example of how their theoretical and theological background badly skewed the materialists interpretations of the raw information. There is one other source that produces iridium in large quantities and the scientists were all well aware of it, but because of the blinders inherit in their view of the world, they couldn't even consider this source. The other source that could produce such massive quantities of iridium all over the earth? Nuclear explosions. Large and numerous. See Tidbit 1.